This furniture arrives mostly assembled. Table not included. Your home is a natural extension of you. 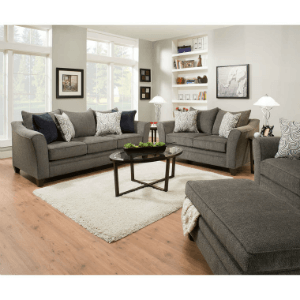 Add these innovative designs to spruce up any decor.Material: Top Grain Leather Pocketed Coil Seating No Sag Springs Solid Wood Legs Padded Outside Backs and Arms Finish: Brown Dimensions: 43in. x 39in. x 38in. This furniture arrives mostly assembled. Table not included. Your home is a natural extension of you. Add these innovative designs to spruce up any decor.Material: Top Grain Leather Pocketed Coil Seating No Sag Springs Solid Wood Legs Padded Outside Backs and Arms Finish: Brown Dimensions: 29in. x 22in. x 20in. Your home is a natural extension of you. Add these innovative designs from Soflex to spruce up any decor. Features Decorative Baseball Stitching, Padded Arms and Back, Pirelli Webbing, Solid Wood Base and quality Bonded Leather. Dimensions: 34in. x 37in. x 32in. The Tufted accent chair is the perfect accent piece to finish off any room. Hardwood frame Pocketed coil seating Hand tufted back chair Made from solid wood Features bonded leather Dimensions: 37in. x 37in. x 39in. Your home is a natural extension of you. Add these innovative designs from Soflex to spruce up any decor. Pocket Coil Seating Padded Outside Arms and Back Loose Seat Cushion Seat Cushion:23in. D by 21in. W Bonded Leather Dimensions: 31in. x 35in. x 36in. Your home is a natural extension of you. Add these innovative designs from Soflex to spruce up any decor. Solid Hardwood frame Loose Seat Cushion Seat Cushion: 24in. D by 18-1/2in. W Pirelli Webbing-Back and seat Bonded Leather Dimensions: 33in. x 37in. x 38in. Your home is a natural extension of you. Add these innovative designs from Soflex to spruce up any decor. Pocket Coil Seating Padded Outside Arms and Back Loose Seat Cushion Seat Cushion: 21-1/2in. D by 20in. W Bonded Leather Dimensions: 37in. x 36in. x 39in. Your home is a natural extension of you. Add these innovative designs from Soflex to spruce up any decor. Pocket Coil Seating Padded Outside Arms and Back Loose Seat Cushion Seat Cushion: 21-1/2in. D by 21in. W Bonded Leather Dimensions: 35in. x 36in. x 39in. Your home is a natural extension of you. Add these innovative designs from Soflex to spruce up any decor. Features No Sag Springs, with 1. 8 Density Foam and pocketed seat coils for added comfort. Size is 85in. x 36in. x 39in. Your home is a natural extension of you. Add these innovative designs from Soflex to spruce up any decor. Features No Sag Springs, with 1. 8 Density Foam and pocketed seat coils for added comfort. Size is 63in. x 36 in. x 39in. Your home is a natural extension of you. Add these innovative designs from Soflex to spruce up any decor. Features No Sag Springs, with 1. 8 Density Foam and pocketed seat coils for added comfort. Size is 38in. x 44in. x 41in. Your home is a natural extension of you. Add these innovative designs from Soflex to spruce up any decor. Features No Sag Springs, with 1. 8 Density Foam and pocketed seat coils for added comfort. Size is 29in. x 25in. x 19in. A Casual Style Beech Finish End Table With Glass Insert, That Will Brighten Up Your Living Room. Very Strong Construction. Easy To Assemble.Dimensions: 25.5 In. x 25.5 In. x 18 In. Please Scroll Below To Check Out The Matching Coffee Table In Our Related Product Section. This chair is the perfect accent piece to finish off any room, with a richly finished wood base for added beauty and style. Product Dimensions: 30 in. x 32 in. x 39 in. Available in multiple colors 1.8 in. density foam seating Decorative baseball stitching Pirelli webbing Made from a solid wood base with bi cast bonded leather. With well-built frames to fit every room and styles from contemporary to casual Soflex is your one-stop for gotta-have-it-fast leather furniture. With well-built frames to fit every room and styles from contemporary to casual Soflex is your one-stop for gotta-have-it-fast leather furniture. Your home is a natural extension of you. Add these innovative designs from Soflex to spruce up any decor. Decorative Baseball Stitching. Pirelli Webbing. Solid Wood Base. Pocketed Coil Seating. Some Assembly Required. Product Dimensions: 30 in. x 32 in. x 39 in.Available in multiple colors 1.8 in. density foam seating Decorative baseball stitching Pirelli webbing Made from a solid wood base with bi cast bonded leather. 3 Pc All Leather Sofa Set With FREE Coffee Table Ottoman. The Set Includes Sofa, Loveseat And Chair. Available In Black, Dark Espresso And Brown. This Is Elegant For Your Living Room. Strong Construction.